You can also order the Gregorian music CD at the bottom of this page. The CD in front of you is not a recording of a professional choir, but of a R.K. Parochial Men’s Choir consisting of amateur singers sharing one thing, the love for church music. 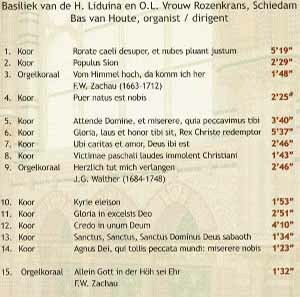 This recording gives an idea of the practice in the Basilica of H. Liduina and O. L. Vrouw Rozenkrans in Schiedam. 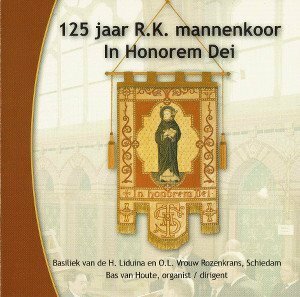 The occasion for this recording is the 125th anniversary of the R.K. Men’s choir ‘In Honorem Dei’. During this period there have of course been many singers and also various organists and conductors. All these times it has been a choir, consisting of amateur singers, who performed the vocals as well as possible during the Eucharist and the Funeral- and Wedding masses. The song (in Latin) consists of Gregorian songs, multi-voice masses and multi-voice motets. On this CD, some Gregorian songs are recorded, including some proprium hymns (varying songs) and ordinarium hymns (fixed hymns). 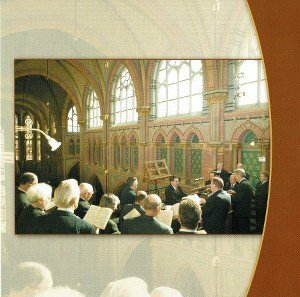 It is probably well known that Gregorian should actually be sung without organ accompaniment but, as has already been said, this recording gives an impression of the daily practice in the Basilica of Schiedam. In alternation to the Gregorian songs, three organ chorales were recorded. Both the accompaniment of the Gregorian hymns and organ chorales are played on the chest organ present in the Basilica. This chest organ was built by Herman Pelgrim and is owned by the foundation Stichting Concerten Basiliek. The organ is used for the execution of the “Weihnachtsoratorium” by J.S. Bach and other major oratorium works, performed regularly in the Basilica. This CD is dedicated to our deceased choir member A Bontenbal. In February 2005, we sang the Requiem mass for him. For more than 40 years, he has used his talents for the church song and especially for the Gregorian. Anton has co-ensured that, through his knowledge of Gregorian, tradition has continued. By naming Anton we do not want to deprive other choir singers who have gone from us too. We wish you a lot of listening pleasure. You can buy the CD online, by following the steps below. We will send you the CD as soon as possible.